Columnar storage format. Druid uses column-oriented storage, meaning it only needs to load the exact columns needed for a particular query. This gives a huge speed boost to queries that only hit a few columns. In addition, each column is stored optimized for its particular data type, which supports fast scans and aggregations. Scalable distributed system. Druid is typically deployed in clusters of tens to hundreds of servers, and can offer ingest rates of millions of records/sec, retention of trillions of records, and query latencies of sub-second to a few seconds. Massively parallel processing. Druid can process a query in parallel across the entire cluster. Realtime or batch ingestion. Druid can ingest data either realtime (ingested data is immediately available for querying) or in batches. Self-healing, self-balancing, easy to operate. As an operator, to scale the cluster out or in, simply add or remove servers and the cluster will rebalance itself automatically, in the background, without any downtime. If any Druid servers fail, the system will automatically route around the damage until those servers can be replaced. Druid is designed to run 24/7 with no need for planned downtimes for any reason, including configuration changes and software updates. Cloud-native, fault-tolerant architecture that won't lose data. Once Druid has ingested your data, a copy is stored safely in deep storage (typically cloud storage, HDFS, or a shared filesystem). Your data can be recovered from deep storage even if every single Druid server fails. For more limited failures affecting just a few Druid servers, replication ensures that queries are still possible while the system recovers. Indexes for quick filtering. Druid uses CONCISE or Roaring compressed bitmap indexes to create indexes that power fast filtering and searching across multiple columns. Approximate algorithms. Druid includes algorithms for approximate count-distinct, approximate ranking, and computation of approximate histograms and quantiles. These algorithms offer bounded memory usage and are often substantially faster than exact computations. For situations where accuracy is more important than speed, Druid also offers exact count-distinct and exact ranking. Automatic summarization at ingest time. Druid optionally supports data summarization at ingestion time. This summarization partially pre-aggregates your data, and can lead to big costs savings and performance boosts. When should I use Druid? Insert rates are very high, but updates are less common. Most of your queries are aggregation and reporting queries ("group by" queries). You may also have searching and scanning queries. You are targeting query latencies of 100ms to a few seconds. Your data has a time component (Druid includes optimizations and design choices specifically related to time). You may have more than one table, but each query hits just one big distributed table. Queries may potentially hit more than one smaller "lookup" table. You have high cardinality data columns (e.g. URLs, user IDs) and need fast counting and ranking over them. You want to load data from Kafka, HDFS, flat files, or object storage like Amazon S3. You need low-latency updates of existing records using a primary key. Druid supports streaming inserts, but not streaming updates (updates are done using background batch jobs). You are building an offline reporting system where query latency is not very important. You want to do "big" joins (joining one big fact table to another big fact table). Druid has a multi-process, distributed architecture that is designed to be cloud-friendly and easy to operate. Each Druid process type can be configured and scaled independently, giving you maximum flexibility over your cluster. This design also provides enhanced fault tolerance: an outage of one component will not immediately affect other components. Coordinator processes manage data availability on the cluster. Overlord processes control the assignment of data ingestion workloads. Broker processes handle queries from external clients. Router processes are optional processes that can route requests to Brokers, Coordinators, and Overlords. Historical processes store queryable data. MiddleManager processes are responsible for ingesting data. Druid processes can be deployed any way you like, but for ease of deployment we suggest organizing them into three server types: Master, Query, and Data. Master: Runs Coordinator and Overlord processes, manages data availability and ingestion. Query: Runs Broker and optional Router processes, handles queries from external clients. Data: Runs Historical and MiddleManager processes, executes ingestion workloads and stores all queryable data. For more details on process and server organization, please see Druid Processses and Servers. In addition to its built-in process types, Druid also has three external dependencies. These are intended to be able to leverage existing infrastructure, where present. Shared file storage accessible by every Druid server. This is typically going to be a distributed object store like S3 or HDFS, or a network mounted filesystem. Druid uses this to store any data that has been ingested into the system. Druid uses deep storage only as a backup of your data and as a way to transfer data in the background between Druid processes. To respond to queries, Historical processes do not read from deep storage, but instead read pre-fetched segments from their local disks before any queries are served. This means that Druid never needs to access deep storage during a query, helping it offer the best query latencies possible. It also means that you must have enough disk space both in deep storage and across your Historical processes for the data you plan to load. For more details, please see Deep storage dependency. The metadata storage holds various shared system metadata such as segment availability information and task information. This is typically going to be a traditional RDBMS like PostgreSQL or MySQL. Used for internal service discovery, coordination, and leader election. 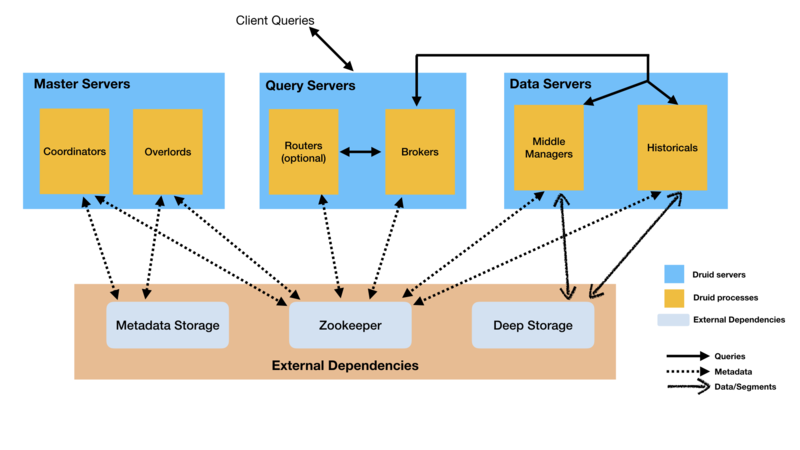 For more details, please see Zookeeper dependency. The idea behind this architecture is to make a Druid cluster simple to operate in production at scale. For example, the separation of deep storage and the metadata store from the rest of the cluster means that Druid processes are radically fault tolerant: even if every single Druid server fails, you can still relaunch your cluster from data stored in deep storage and the metadata store. Periodically, segments are committed and published. At this point, they are written to deep storage, become immutable, and move from MiddleManagers to the Historical processes (see Architecture above for details). An entry about the segment is also written to the metadata store. This entry is a self-describing bit of metadata about the segment, including things like the schema of the segment, its size, and its location on deep storage. These entries are what the Coordinator uses to know what data should be available on the cluster. Queries first enter the Broker, where the Broker will identify which segments have data that may pertain to that query. The list of segments is always pruned by time, and may also be pruned by other attributes depending on how your datasource is partitioned. The Broker will then identify which Historicals and MiddleManagers are serving those segments and send a rewritten subquery to each of those processes. The Historical/MiddleManager processes will take in the queries, process them and return results. The Broker receives results and merges them together to get the final answer, which it returns to the original caller. Broker pruning is an important way that Druid limits the amount of data that must be scanned for each query, but it is not the only way. For filters at a more granular level than what the Broker can use for pruning, indexing structures inside each segment allow Druid to figure out which (if any) rows match the filter set before looking at any row of data. Once Druid knows which rows match a particular query, it only accesses the specific columns it needs for that query. Within those columns, Druid can skip from row to row, avoiding reading data that doesn't match the query filter.